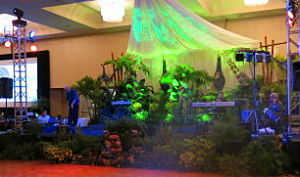 If you’re tiring of traditional benefit auction themes, one option is to bypass the obvious choices and go with a color. For instance, emerald. 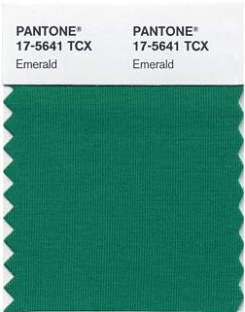 I’m talking about PANTONE® 17-5641 TCS Emerald: the official color of 2013. At Art Basel Miami Beach last month (Dec 2012), I saw this work of art, which incorporates emerald. This might be a source of inspiration for us in the auction planning business. Apparently the color has been trending in women’s clothing. Retailers are moving to cash in. Sephora will offer the shade in eye shadows and nail polishes by March. JCPenney is the exclusive seller of Pantone emerald bedding, pillows, bath towels, and accessories. Frankly I’m not a fan. I love green, but this is too heavy. It reminds me of Christmas, a season we’re leaving. Furthermore, I’ve not seen this color much used in benefits, so I’m a bit stumped on what to show you for ideas. But in my effort to make it work, I dug through my photos to find some elements for inspiration. Here’s the best of what I found. 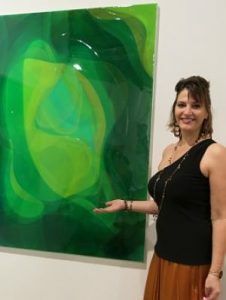 I wouldn’t call this emerald, but green lights bathed this December 2012 auction gala in Miami. As you think about how to incorporate emerald (or any color) in to your gala, I find it helpful to think about the event in sections or components. Here are some ideas. Auction centerpieces. Live plants would incorporate emerald into the scheme in a natural way. 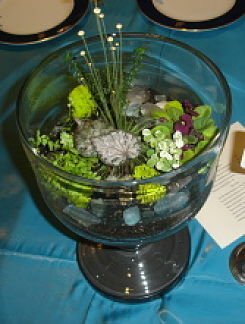 Plastic “gemstones” on your silent auction tables in a bright emerald color. These could be scattered throughout all the tables or just in the jewelry section. Thanks so much for this article! I love your ideas on how to incorporate Emerald into the overall scheme for a gala or party. Who knows, Erin, maybe it will become more popular in the print industry this year, too.